This question was asked of me and I’ll give a few reasons that Seed Balls might be useful. Fun to make with kids. It gets kids involved and interested in gardening. The kids can then take them home to plant outside. Easy to plant. Some people can’t be bothered to plant a seed, but might be convinced to drop a seed ball into a garden area. It doesn’t get any easier than that. Seed balls protect the seeds from birds and keeps the seeds from blowing away. Guerrilla Gardening – sometimes there may be an area that needs some flowers, but you don’t legally and technically own the property. Just throw a few seed balls into the area and see what happens. I of course, can’t condone this activity, but I’ve heard that some people do this. I tested three different seed ball combinations and found that probably all three would work. I used a combination of compost and clay on the top two trials and a combination of ProMix and clay in the lower picture. The Promix is lighter and definitely falls apart better than the compost. The picture below is how it falls apart after about a month. We had a lot of rain over that period, so in colder temperatures, it would hold together longer. Compost and Clay – for some reason the 10 to 1 ratio seems to be falling apart better than the 15 to one ratio. This is just the opposite of what I’d expect. Red Clay – this is a dry clay that I bought at a local pottery store. Water – just add enough so that you can roll the ball. Seeds – after you make a ball, I add three seeds and roll again into a ball. You can be as creative as you’d like, but realize that most of the seeds will germinate with an inch or so of each other. Results – I’d use the ten 10 to one ratio. 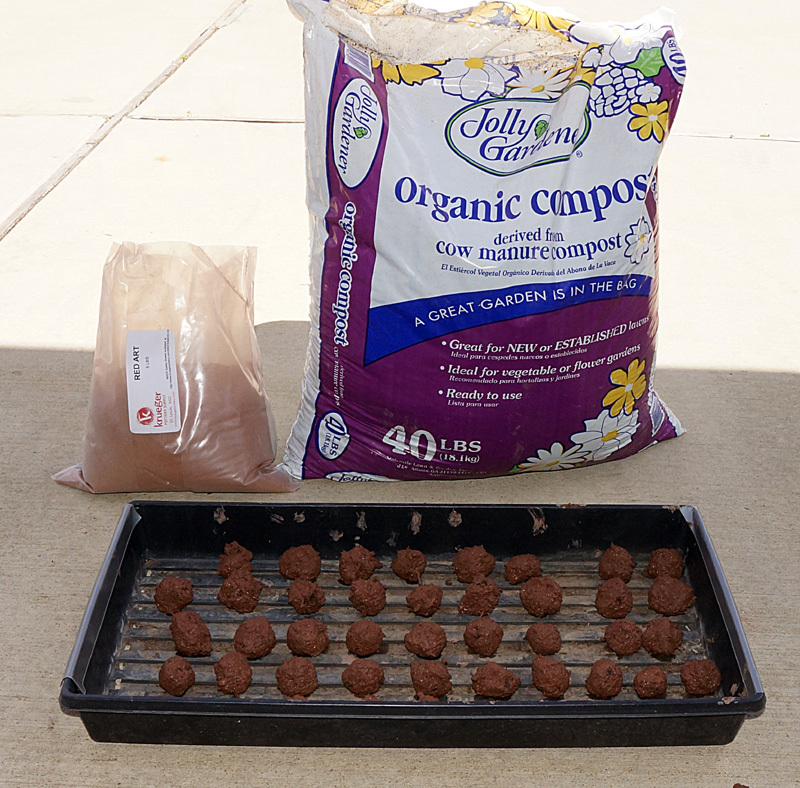 You can use either compost or ProMix or whatever artificial potting mix you have. The Potting Mix will fall apart quicker. If you are putting out your seeds balls in the fall, it probably won’t matter, but if you are planting them in the spring, I’d use the ProMix and clay combination. The idea behind a Seed Ball is to make an easy way plant a seed. You surround a seed with clay and other ingredients, let it dry and harden and then you can put it anywhere to dissolve and let the seed germinate. There seem to be a number of recipes on the Net, so I’m going to experiment and come up with my own recipe. Most Seedball Recipes contain these three ingredients plus water of course. Clay-Compost-Seeds – there are many ratios. From my gardening experience, putting a whole lot of seeds in one tiny ball doesn’t make much sense and is wasteful. I’d suggest one to 3 seeds per ball depending on how well the seed will germinate. 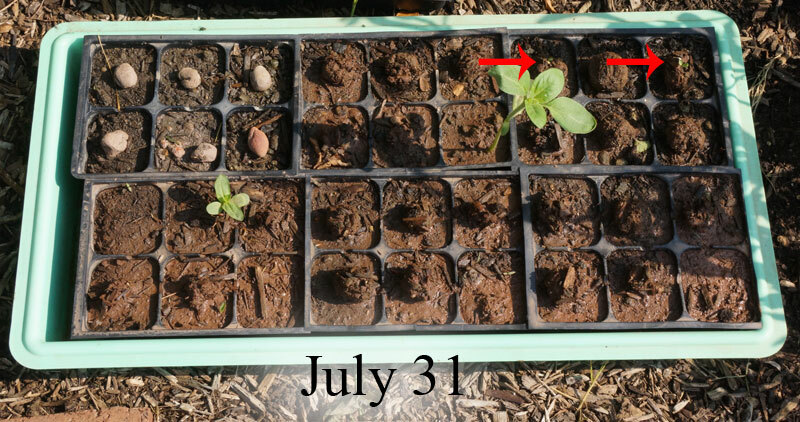 My first experiment is to just use some potting clay, roll it up and put a seed in side (zinnia). I also found that after the clay dries, you can color it with food dye. These balls can be made quite small. Most of mine are about the size of a nickel. I use 1 part dried clay, 3 parts compost and 1/2 part of water. It’s very sticky and easy to roll into a ball. I got about 50 balls using a 12 ounce cup as one part measure. I then added one or two seeds per ball. [Note – because of my poor germination, I’m going to try ten seeds per ball] The balls are slightly larger than a quarter. I made the balls first and then added the seeds, pressed the seeds to the middle of the ball and then rolled again. I then set them in the sun to dry. I got five pounds of dried clay from Krueger Pottery, 8153 Big Bend Blvd, St. Louis MO 63119 for $4.34. Below are my seed balls in trays. I planted five different types of seeds in the balls. I also put some of my seed balls in my garden to see how they will germinate. 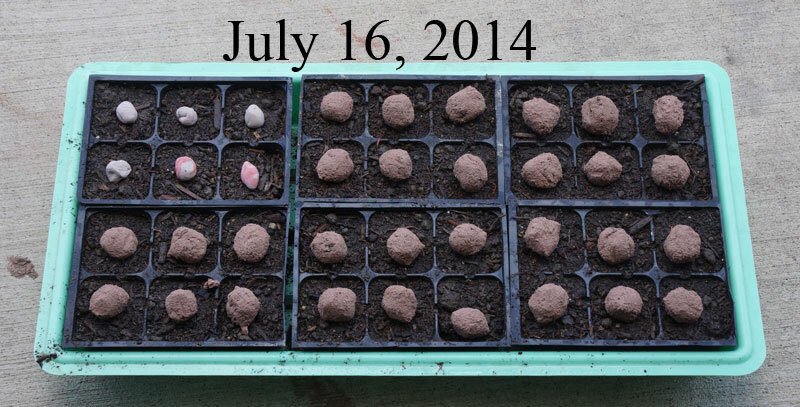 Here are the results of the seed ball test below. Not much is happening after two weeks. The balls with compost are doing better, but still not very good. At the two red arrows there are some tiny seedlings emerging from the seed balls. I’m disappointed with the results, but will try again in the fall with some native seeds that need cold stratification – echinacea, milkweed, etc.